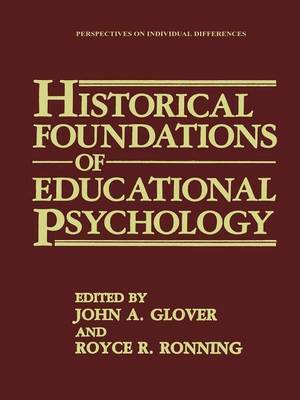 This volume represents a beginning effort to compile a history of educational psychology The project began, innocuously enough, several years ago when we decided to add mon material about the history of educational psychology to the undergraduate course we were teaching. What seemed like a simple task became very complex as we searched in vain for a volume dealing with the topic. We ended up drawing on various histories of psychology that devoted anywhere from a few paragraphs to several pages to the topic and on a very few articles addressing the issue. We were startled, frankly, by the apparent lack of interest in the history of our field and decided to attempt to compile a history ourselves. As is the case with any edited volume, the contributing authors deserve credit for its positive features. They uniformly made every effort asked of them and taught us much about educational psychology. Any errors or omissions are our responsibility alone.